I last sampled a pint in the Brown Horse at Winster, not far from Lake Windermere, when I was 21 in 1989 – and maybe my memory has hazed over the years but, my goodness, things have changed. Back then, there were a few gingham-topped local girls playing pool, balancing a pint of Skol or some such on a pool table, chattering against the muzak wallpaper of that sunny decade. Kylie, Simple Minds and the Pet Shop Boys were en vogue, echoing from some speaker, and chicken-in-the-basket alongside Frank Cooper’s tomato sauce, served in those impossibly non-ergonomic sauce sachets, were not long out of fashion. A labrador, maybe, lounged in the sun outside while walkers perhaps inspected their perspexed maps in the rain. I’m not quite sure whatever happened to Frank Cooper, nor indeed the now seemingly not-so-ubiquitous Skol, but, a bit like Kylie, this pub/eatery has transformed from being quite a sweet and demure looking place with a pleasant aspect, to become a confident and exuberant attraction, whose revamped visage and interiors speak of a decadent and knowing appeal. And not without a little country swagger. 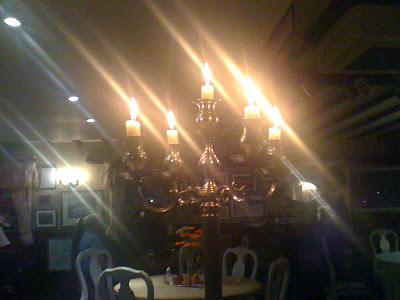 More to boot, there’s even a touch of rural Gothic about the place; high-collared pewter style candelabras, emanating the kind of light which Byron and his cronies might have taken their laudanum by, perfectly adorn dining tables and settles which otherwise have a bucolic charm. Equally, guests can recline on long benches with half-cartwheel backs; or posteriorise themselves on white chairs set against completely contrasting yet appealing round pine tables. Furniture for lovers of the sublimely oxymoronic combined with the charm and occasional chintz of a Gasthof in some high alpine pasture. By contrast, for those of a Romantic sensibility, the main dining area exudes a dark-panelled charm; if a little haughty and equally semi-Teutonic. In fact, sitting on the fringe of the cheery lounge bar area, enjoying my lamb tagine served by engagingly polo-shirted bar staff, and glancing over my shoulder towards the dining room, the incongruous charm of the new look pub struck home. Not so much a Brown Horse anymore – rustic, dependable and perhaps a little dull, without being critical – but more of a frisky English country saddle horse with hints of the continental Palomino – or even a Bavarian Warmblood. The dark Jacobean-style décor of the more formal dining area echoes the style of rich Cumbrian country squires combined with the more benign haunts and halls of the imagination of Bram Stoker. (Jonathan Harker would even tell you that some parts of Dracula’s castle had incongruously welcoming quarters and neatly turned-down bed-linen. Maybe even a Transylvanian squared-sachet of blood-red sauce for the more discerning guest). The frisson of the darkly exotic always sharpens the appetite and the passions. Combine that with all the culinary flair and imagination which seems to be the signature style of many a Lakes hostelry these days – and the quality of service – and the pied appeal becomes utterly intoxicating. The 80s might have gone – and all the exuberance of the latter days of that decade - but looking at the confident effervescence on show at the Brown Horse, grasp this exhilarating horse’s tails when you can. Twenty one years might just slip by otherwise.